Sabbath Walk: Upgrading to What Ends? TITLE: UPGRADING TO WHAT ENDS? It was nice to be back on familiar grounds, somewhat familiar grounds. Having left Singapore for nearly eleven years, I notice the huge changes in the small island country's landscape. Up North, the Woodlands area has become a major Northern hub. 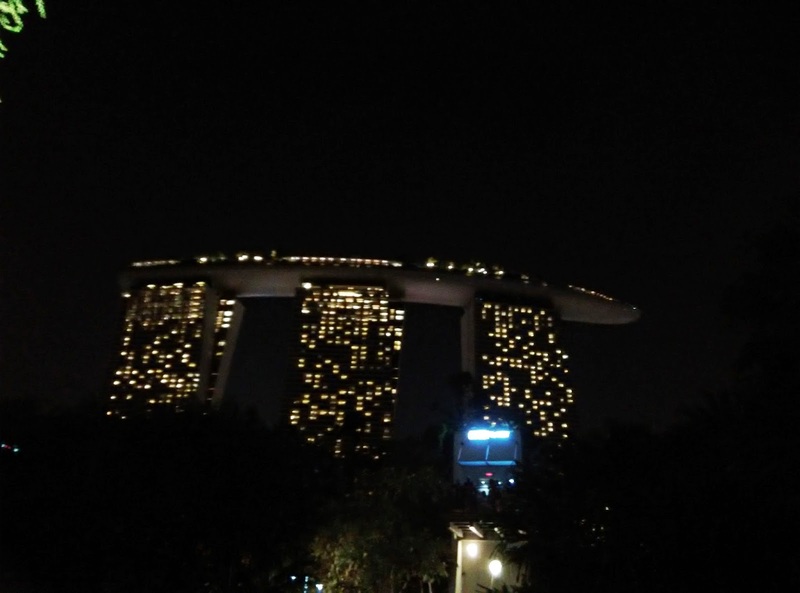 Down South, the Marina Bay area has been transformed to a sprawling architectural wonder, with Marina Bay Sands and Gardens by the Bay as the popular attractions. Even locals can testify of the great transformation of the old to the current new. If it is a big change for them, what about people like me who had not seen such changes for so many years? The transit system has been expanded with the Circle Line and the DownTown lines. The North-South and East-West lines have been augmented with additional interchanges and greater connections to the rest of the MRT network. Dhoby Ghaut for example is a major interchange that connects to three different lines! I was surprised to find myself in the middle of Plaza Singapura, which itself had also been transformed. That is not all. Even the streets and roads I was familiar with had been modified to make way for the new infrastructures in the business district. There are more office towers, more shopping centers, more food offerings, and of course, more people. As I traveled on the very efficient transit system, I noticed that most of the people had smartphones and pretty covers. Many had data plans and were constantly connected to the Internet. I watched people more engrossed in their bright screens. Back then, people were mainly texting, staring into blank space, or simply dozing off. Nowadays, people seemed to be always awake, always doing something with their phones, and always streaming or reading something in front of them. If one is a working professional, a student, or someone below the age of 60, chances are, they would be online. In my brief interactions with various people, if there is one word synonymous with my observations of Singapore culture and lifestyle so far, it would be the word "upgrade." From houses to cars; computers to smartphones; basic education to advanced studies; buildings to food centers; material things or consumer expectations; Singaporeans are engrossed in all things upgrading. What was in existence a decade ago are either demolished for something newer or upgraded to something more modern. I cannot recognize Plaza Singapura anymore. The same goes to malls along the famous Orchard Road. Like the government instituted campaign of "Make Courtesy Our Way of Life" back in the 70s/80s, it would seem to me that the current mood island-wide is to "Make Upgrading Our Way of Life." People upgrade everything. It is not a matter of why but a question of when. My brother just purchased a new 4G smartphone which I am temporarily using. Just a few years back, people were talking about the potential of a 3G data streaming speed. Now, the 3G standard has been pegged back in terms of speed and efficiency by the new 4G network. It is common to see people carrying more than one digital device, whether they are tablets, portable computers, or smartphones. Something disturbs me. It is that uncritical acceptance of upgrading that makes me wonder who is in charge. Some people tell me they have no choice. Really? From what I see, many things we call upgrading are mere changes from the outside to give new covers to old needs. Hospital beds have various categories from A to C. With such upgrading trends, the C of today may be the B of tomorrow. The B of tomorrow will be the A of the coming future. My question: To what ends are we upgrading? Is there no ceiling? McDonald's upgrading word is "Upsizing." When we order a meal, sometimes the server would ask if we want to upsize our meal for additional money. In corporate world, upsize is another word for business expansion. During good times there will be frantic expansion of production capacities. In bad times, companies would downsize their workforce. Downsize is a scary word for any employee. It readily sparks questions like: "Will it be me?" or "Why me?" The single biggest factor in any decision to upsize or downsize is about profits. Am I losing money? If yes, downsize by chopping off a number of positions. In recession times, downsizing is equated to mass layoffs. Personally, I prefer the word "right-sizing." In the business environment, the single biggest factor for upsizing or downsizing is money. With more money, one can venture forth as an investment.With need for more money, one may very well retrench workers. In terms of spirituality, can we upsize or downsize our spirituality. What we need more is not a crazy doctrine of upgrading ourselves to death. It is about understanding our real needs accurately and humbly. Let me prescribe contentment as a beautiful way of life. For there are many things that cannot be upgraded like houses, cars, or smartphones. Spirituality is one of them. We cannot upgrade our spirituality just by taking a few courses or to improve our knowledge about true discipleship by doing a degree in discipleship. For things of heaven are not upgraded like the things of the world. What God has is already perfect. Heaven is a perfect place. That's what I feel about upgrading ourselves without adequate reflection or critical thinking. Maybe we are forced to. Maybe we have to. Ultimately, the decisions are left to our best discernment available. I think upgrading has its merits. Unfortunately, if we simply go with the flow of upgrading, instead of depending on the teaching of God, I fear that in a culture of incessant upgrading, we may substitute the teachings of God with the upgrading mentality of men, and to be drawn into the false god of upgrading, thinking that those things will bring us peace, prosperity and symbolize progress. If that is the case, the mentality of upgrading has already taken root to become a god in itself. Remember my friends. It is not upgrading or doing things better that is going to help us grow our spirituality. It is that firm conviction that God provides for all our needs and only in God can we find contentment. Only in God can we find peace. Only in God can we find true prosperity and spiritual progress. Anything leading us closer to God is worth it. Not upgrading with uncritical acceptance. Warning. Upgrading non-stop does not make us better and contented persons. Like a drug, it locks us into an endless cycle of addiction that gets more and more difficult to escape from.